I’ve been admiring the above piece all week in anticipation of Easter. 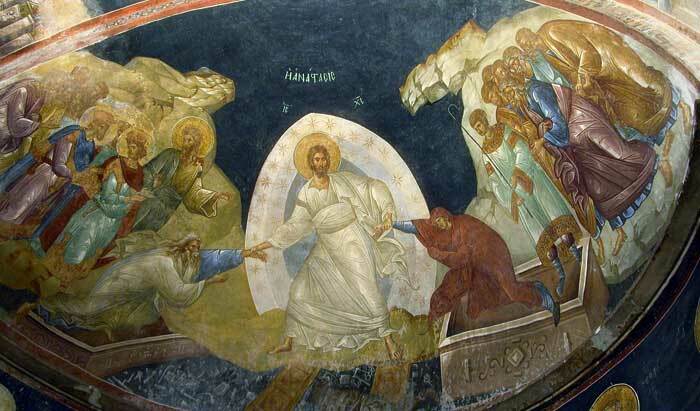 (Click to enlarge) It’s from Chora Church in Istanbul. The Greek is ἡ ἀνάστασις, in all capital letters=the resurrection. The letters just above Jesus are the Greek abbreviation for Jesus Christ. Two blogs I read posted a similar icon this morning. I love how Jesus (Life) is touching Adam and Eve (death), pulling them out of their graves, from death to resurrection.